Families with disabled kids in Tennessee are supporting a bill that would change some TennCare income requirements that keep some living in poverty. 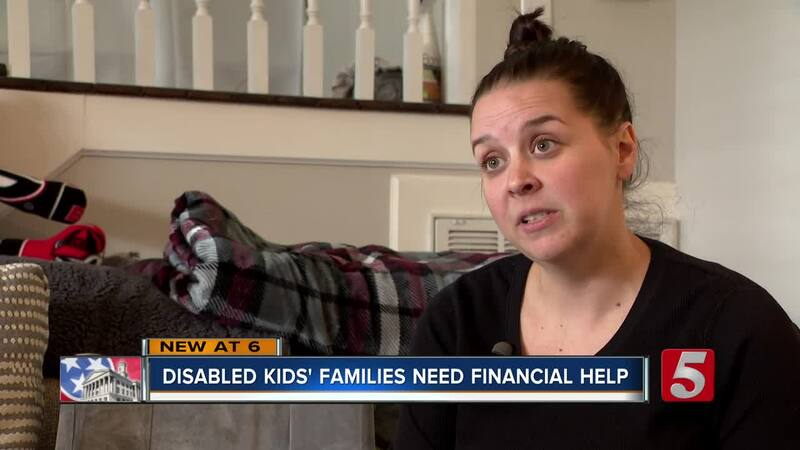 NASHVILLE, Tenn. (WTVF) — Families with disabled kids in Tennessee are supporting a bill that would change some TennCare income requirements that keep some living in poverty. Under the burden of crippling medical bills, families with children who need frequent and complicated medical care are opting to quit their jobs to qualify for the minimum income for their children. In Tennessee, families have to meet certain income requirements to qualify for TennCare insurance. If families make more than that amount and have disabled kids, they could have to pay tens of thousands, even hundreds of thousand dollars a year. For a family of two, that income level is 34,731. For a family like Tori Goddard's, it's impossible to hold down a job, live in Nashville near the hospital and pay for her daughter Zoey's medical bills. "It's almost soul crushing is the best way I can describe it. You work so hard and you pour all of your energy into your child and keeping them alive and getting them what they need and making sure you give them the best quality of life possible," said Goddard. Goddard had to quit her job to qualify for TennCare and pay for Zoey's consitent needs. Zoey has a congenital heart defect and other health problems. She's had 13 surgeries, three of them open heart. She's had five strokes and gone into cardiac arrest seven times. Through the support of Goddard's family, they live in a home in West Nashville. However, Goddard said she's unable to pay for a car or own the house she lives in due to medical costs. So, she's committed to changing state policy around TennCare qualifications. Goddard and a group of other families with disabled children visited the state capitol Tuesday to ask lawmakers to pass a bill that would allow the children to maintain their TennCare coverage while their parents could work higher paying jobs. "We want to be a productive member of society and we can't because we have a child with major medical disabilities," said Goddard. The Tennessee Disabilities Coalition sponsored Tuesday's event and are working to change the law such that TennCare uses the child's income to qualify the for care, rather than the parents. The bill advocates say will carry the TennCare changes is currently in committee.